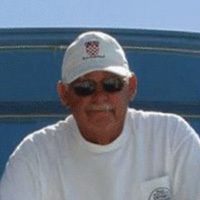 Captain Kenny Barhanovich was born and raised in Biloxi on the Mississippi Gulf where he built his long fishing career. In the late 1950s, Barhanovich--then 14-- became First Mate on the trawler President Kennedy owned by his dad Yankee Barhanovich. The Barhanoviches changed the boat name to Miss Hospitality to better appeal to visitors and they adopted their signature phrase, “Fish-N-Fun” for the next 40-plus years. The younger Barhanovich worked for Ingalls Shipbuilding for some time to support his wife and three daughters, but ultimately returned to the charter fishing business he loved. He earned his captain’s license and he and his father upgraded to a 51’ custom sportfisher. Barhanovich faced many obstacles during his career, including the death of his father and numerous hurricanes that impacted Gulf coast charter fishing businesses. But over five decades, Barhanovich never gave up on the business he helped his father create. He still enjoys plying Gulf waters and putting charter customers on great fish.